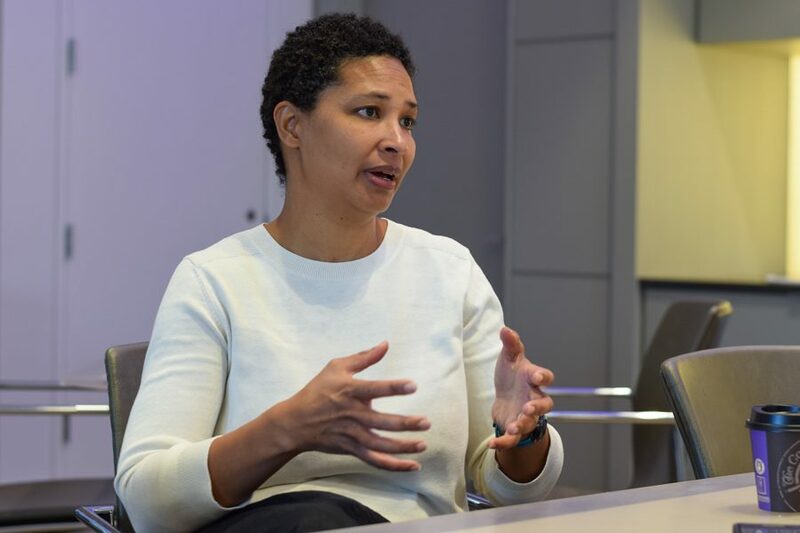 Danielle Allen discusses her inspiration for writing “Our Declaration.” Allen delivered the One Book One Northwestern keynote address Thursday, speaking about the modern relevance of the Declaration of Independence. Author Danielle Allen said her experiences teaching people with limited access to education inspired her book “Our Declaration: A Reading of the Declaration of Independence in Defense of Equality,” which was required reading for all Northwestern first-year students this year. Allen, a professor at the Harvard Graduate School of Education, spoke to about 250 people at Technological Institute on Thursday. In her One Book One Northwestern keynote address, Allen said she taught her students about the Declaration of Independence because she strongly believes it is relevant to modern times. The writer said her involvement in the Odyssey Project — a program that offers humanities courses to adults who live below the poverty line — helped inspire her book. Allen said her reading of the Declaration of Independence — as advocating liberty and equality — is part of a long history of the document being used for social change. She added that abolitionists were the first activists to use the Declaration for advocacy purposes. The Declaration states that it is the responsibility of the people to change the government when it is not working. If the government fails to protect the rights of the people, she said, they must advocate for alterations. McCormick freshman Samuel Kim said he didn’t realize how relevant the document still is to the current government. “Even as the institutions of our country evolve over time, we can still apply the Declaration to every aspect of our institutions, not just government but also education and universities,” he said. Allen said it is important to continue dialogue about the Declaration because of its relevance to modern society. She added that the people behind the Declaration tried to change their lives and escape the restrictions being placed on them, just as many people are trying to do today. Weinberg freshman Tejas Sekhar said he was intrigued by the unique lens with which Allen approached the Declaration. He said he was surprised to learn the Declaration was used as a tool for advocacy. Sekhar said he found the document –– despite being written in the 18th century –– to be very relevant after Allen’s speech.